What Is Your Favorite Writing Tool? I am the king of Post-it notes. They are on my wallet, my cell phone, and there is one on my computer now. Somehow, I always find myself with a billion ideas and no way to collect them all. Sure, I could put them in a note book and squint at them later or store them in a word file or Google document that I’ll never open, but I wanted to SEE them. I wanted to be able to lay them down side by side and also track my writing progress. 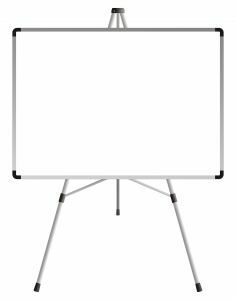 Thus enter my favorite writing tool – my white board. My wife was at the office supply store and discovered they were wicked cheap and on sale. I’d love a nice frosted glass, trendy one, but I’d also like to not change my one year olds’ diapers. I have to understand what is necessary and what is me just wanting a cool new toy. The reality is that having that writing software/tool is not going to make me better. Working hard consistently is. And now I have a place to keep track of my progress and flesh out ideas thanks to my wonderful bride. I’ve hung the white board next to my bed so I can review tasks every day before I go to sleep and remind myself of upcoming goals and deadlines. I can also gaze at it as I doze off and make a mental note to get up early and get to work. What is your favorite writing tool? How do you stay organized and on top of your tasks? ← Do You Struggle To Find Time To Write?